Skin cancer runs in my family so I try very hard not to risk a sunburn. I recently missed a spot on my shoulder somehow though and wound up with a really painful burned spot. Meanwhile, my partner just doesn't care enough to put sunscreen on then complains about his scorched arms and neck. 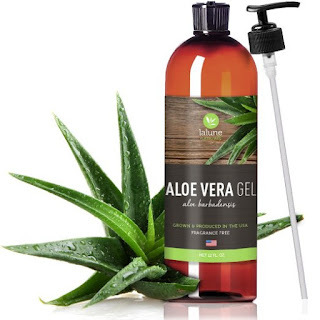 So I've been keeping this Aloe Vera Gel from La Lune Naturals on hand. I originally bought it to use as a moisturizer but didn't find it effective enough in spite of how gentle it is. It has been wonderful for sunburns though. It's a lot thinner in consistency than others I have tried which makes it spread well and absorb quickly so it gets to work soothing burns right away. I would very much recommend this product to my friends and followers. Note: I received a complimentary product for review. 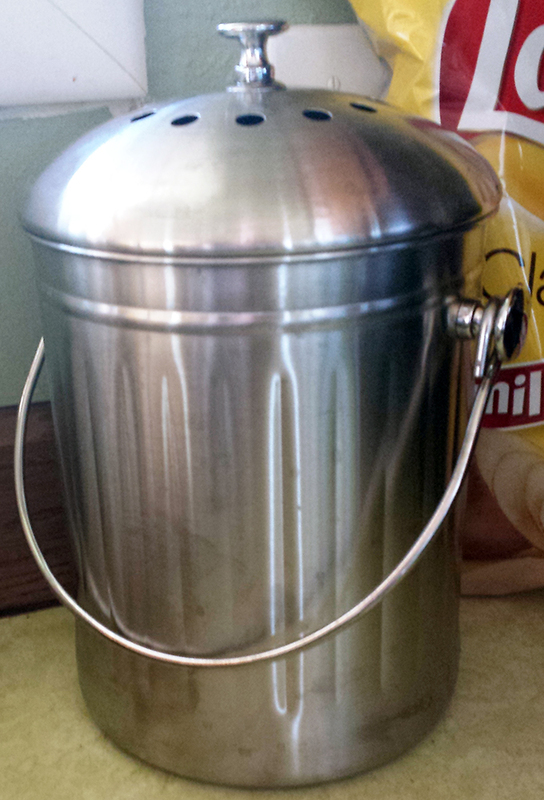 I've been composting for some time now but had not gotten around to finding a nice pail for keeping my scraps in. I had just been making use of an old ice cream bucket (you know those plastic ones) but it was cracked and stained and quite honestly... ugly! The worst part about my old ice cream bucket though was that it was really stinky, especially in the summer when the kitchen is hot. Fruit flies would breed in it and in general it was just yucky. This pail, however, has been amazing. It's unobtrusive and has charcoal filters which have completely eliminated the stink. It's easy to wash with warm water and soap between dumpings and the filters can easily be replaced. Keeping scraps is much less of an embarrassment and chore now. If you're looking for a pail for scraps in your kitchen I can't recommend this one enough. It's attractive but not attention grabbing, conquers the odors associated with overripe fruit or onion pieces that some let linger, and holds a lot. It's so sturdy and easy to use I imagine I will have this for the rest of my life. Notes: I received this product complimentary in exchange for an honest review. 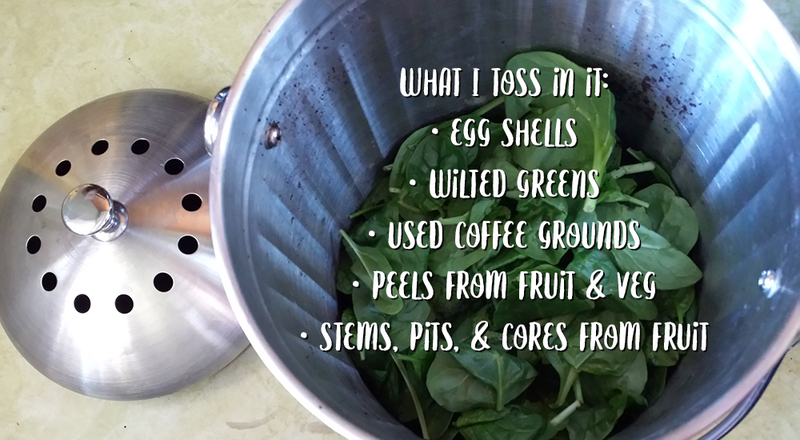 Product Details: Do you routinely save food scraps for your compost pile? Are you still using an ugly and eco-unfriendly plastic pail? The Chef's Star Stainless Steel Compost Bin is the perfect home solution for those looking for an easy way to start composting. Composting is a free and simple way to make your own fertilizer while protecting the environment at the same time. It improves soil health and fertility by providing organic nutrient rich food for microorganisms, which will keep your soil healthy and balanced. 304 Grade Stainless Steel: High quality and pleasing to the eye. Stainless steel is perfect for any kitchen. Modern or not. You won't have to hide your bin under the sink anymore. It will not rush, scratch, or chip. It also won't harbor bacteria or leach unhealthy chemicals as plastic containers do. This is especially important if you will be using your compost on food crops. 1 Gallon Size: It's large enough to hold a few days worth of vegetable peelings, eggshells, coffee grounds and other compost material small enough to fit right on top of your kitchen counter. Replaceable Charcoal Filter: Charcoal acts as a natural filter that absorbs odors and prevents them from reaching the air outside the bin. This bin comes fitted with 1 charcoal liner set. Convenient Handle: There is a built-in handle to carry your compost outside to your garden. Easy to clean: Your bin and charcoal filter can be cleaned with soap and water. Learn how this one thing makes a big impact! I love taking little learning breaks over at Recyclebank. Not only can you understand how our planet is impacted by the things we throw away and learn how to be better stewards, you earn points for rewards too. I use mine to get magazine subscriptions. I read my magazines then pass them to my MIL who then passes them on to the hospital's waiting rooms. A nifty idea I learned from visiting Recyclebank, natch! My family is pretty big on natural home remedies so I've been taking activated charcoal pills for digestive upsets for a couple of decades. It was kind of this family secret we loved to share with others as if we knew something magical. lol But in the past couple of years it, like many of our other favorites, has come into the light. Uses for it pop up on Pinterest left and right, suddenly it's in every product from face masks to ice cream! And it's a great thing. Now you can pick up a half pound bag of loose powder on Amazon from Moody Zook for a very reasonable price. The advantage with buying it in loose powder form (aside from it being more economical) is that it's easier to use for multiple purposes. Put some in a container just for teeth whitening. Add a spoonful to your favorite clay mask to add detoxifying benefits. If you're feeling really ambitious you can even purchase empty gelatin capsules and make your own charcoal pills so you're not drinking it in water. I've been so happy with this! If you've been considering giving it a try I highly recommend it. Notes: I received a complimentary product in exchange for an honest review. I am not affiliated with the brand/seller. TEETH WHITENING FOR THAT DIRTY MOUTH: Our Activated Charcoal is the best teeth whiteRemoves teeth stain and whitens your teeth naturally! Cleanses your mouth for fresher breath and better oral health. And if you're up for a facial or body scrub, this charcoal powder can buff out dead skin cells, leaving your skin smooth and pores cleaner and tighter. EXFOLIATE AND CLEANSE YOUR PORES: Apply as a facial mask for smooth skin! Our high-grade activated carbon powder is super fine and not gritty. 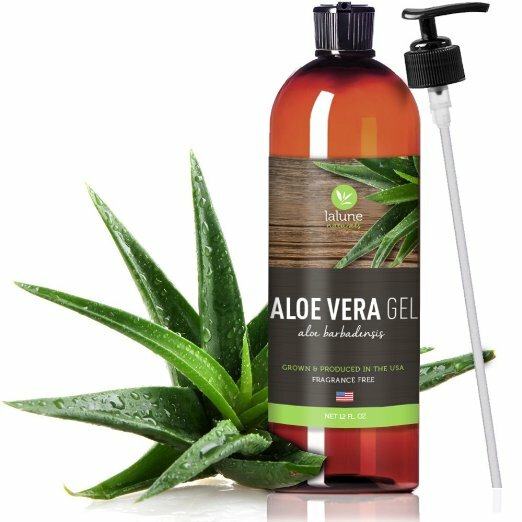 It feels smooth and velvety when mixed with water or essential oil. Safe and gentle for use as a homemade face mask, facial scrub, toothpaste alternative, or a tooth whitening agent. 100% NATURAL - MADE FROM ORGANIC COCONUT ACTIVATED CARBON: That's it! Activated charcoal produced from coconut shells is the highest quality carbon available. It is ultra absorbent, making it extremely effective in removing impurities compared to other carbon sources like wood, peat, and sawdust. 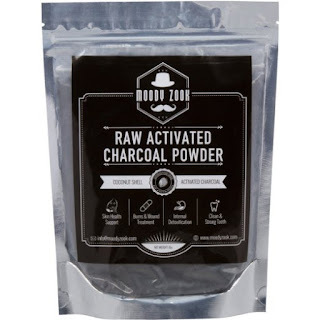 Enjoy odorless and toxic-free fine charcoal powder for various uses. 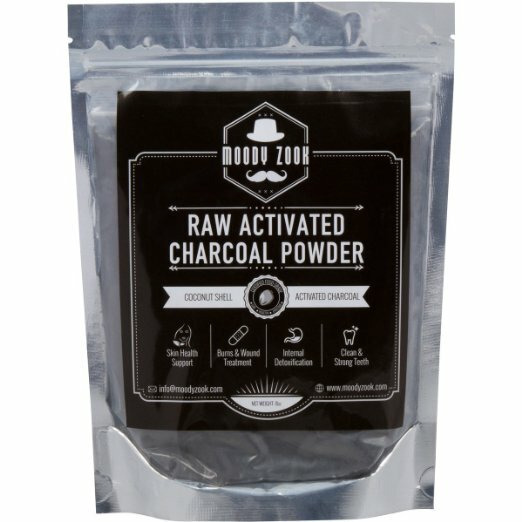 HELPS TREAT ACNE, BURNS, AND INSECT BITES: Use this quality coconut charcoal powder for treating acne, insect bites, bee stings, wound cleansing, removing makeup, and even for removing body odor. Simply blend in a small amount of coconut oil or any essential oil of choice and it's ready to go.